The U.S. stock market is dominating again this year, and money managers may soon face some unpalatable choices. It’s not even close. The S&P 500 Index is up 9.9 percent in the eight months through August, including dividends. Meanwhile, overseas stocks, as measuredby the MSCI ACWI ex-USA Index, are down 3.2 percent. U.S. bonds, as represented by the Bloomberg Barclays U.S. Aggregate Bond Index, are down 1 percent. And hedge funds, as tracked by the HFRI Fund Weighted Composite Index, are up a modest 1.7 percent. 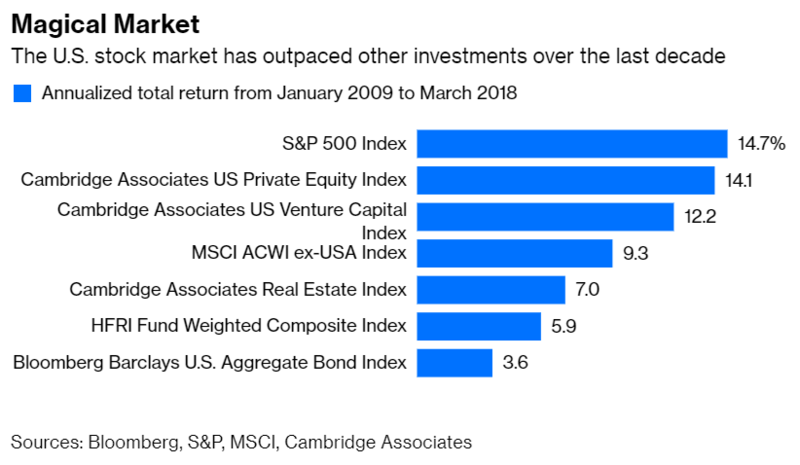 It’s too soon to know how private assets, such as venture capital, private equity and real estate, have done because their results are generally reported on a multi-month lag. But it’s not likely to matter. Even the most ardent admirers of private assets, such as elite university endowments, allocate only a portion of their portfolios to them. So the results, however good, are unlikely to make up for the drag from other assets. Few investors would notice, or even care, if it were just one year — but the S&P 500 has dominated for nearly a decade. It has outpaced overseas stocks by 6.6 percentage points a year since 2009, U.S. bonds by 11.8 percentage points, and hedge funds by 9.4 percentage points. And, yes, it has even trumped private assets. It beat the Cambridge Associates US Venture Capital Index by 2.5 percentage points a year from 2009 through March of this year, the most recent period for which numbers are available. It also beat the Cambridge Associates US Private Equity Index by 0.6 percentage points, and the Cambridge Associates Real Estate Index by 7.7 percentage points. Most stock pickers can’t keep up, either. Just 10 percent of U.S. large-cap mutual funds managed to beat the S&P 500 over the 10 years through 2017, according to the most recent SPIVA U.S. scorecard. It’s a quandary for managers because U.S. investors care a lot about keeping up with the S&P 500. It’s practically synonymous with the market and its results are widely disseminated. It’s also cheap and easy to buy thanks to the many low-cost index funds that track it or something similar — last week, Fidelity Investments rolled out a U.S. large-cap mutual fund that charges zero fees. And investors have been encouraged by luminaries such as Warren Buffett and Vanguard Group founder John Bogle, who have said that most people need little else in their portfolios. Even so, there are good reasons why managers don’t dump everything and chase the S&P 500. 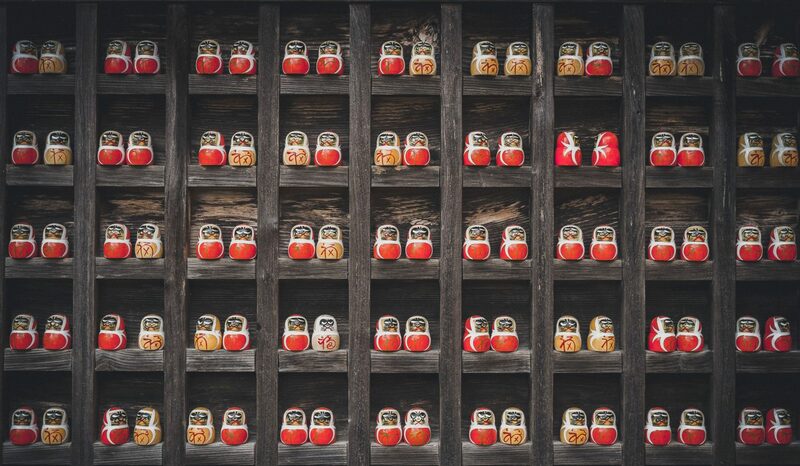 The most obvious is diversification: They are more likely to achieve better risk-adjusted results over time by spreading their bets across different types of investments. Another reason is that U.S. stocks are, according to at least one measure, alarmingly expensive. 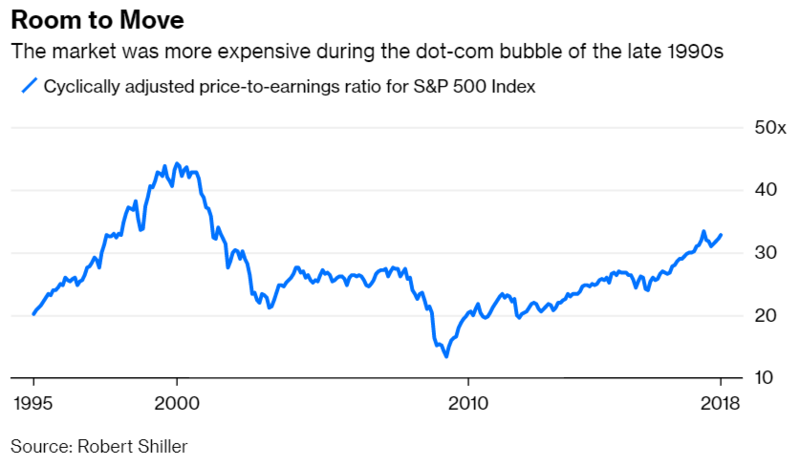 The S&P 500’s cyclically adjusted price-to-earnings, or CAPE, ratio is 33, according to Yale University Professor Robert Shiller. Since 1881, the metric has only been higher once — at the height of the dot-com bubble. This doesn’t mean the market can’t keep rising, of course. Shiller toldBloomberg TV recently that the market could get “a lot higher before it comes down.” In fact, the S&P 500 would have to climb another 33 percent to match the CAPE’s record high of 44 in December 1999. It’s a prospect that will no doubt send chills through managers old enough to have experienced the late 1990s. The S&P 500 had an epic five-year run from 1995 to 1999. Then as now, no reasonably diversified portfolio had a chance. Nevertheless, investors famously berated managers to keep up, leaving them with two unappealing choices: abandon their strategy and chase the market, or watch investors walk out the door. Those who stuck to their playbook paid the price, at least for a time. One such firm was Grantham Mayo Van Otterloo & Co., whose assets under management dropped to $22 billion by 2001 from $26 billion in 1997. Predictably, investors changed their minds after the S&P 500 handed them a decline of 44 percent between April 2000 and September 2002. GMO’s assets swelled to $53 billion by the end of 2003. This bull market isn’t likely to last forever, either. But while it does, managers may increasingly have to choose between their convictions and their clients.